I’ve known Karen Bleakley a long time now. Or it certainly feels like a long time – I know she won’t mind me saying it! You see, us twin mums have a certain sense of humour. You kinda have to. From double stretch marks, double prams, and double the number (or more) of frankly tiring comments from random strangers, your life as a parent of twins is very different to that of singletons – as we call one baby at a time in the wonderful world of multiples. I met Karen online back in 2011. My twins were newborns. She was just coming out of that life-changing first year. She was from nearby Lincoln, although she lived on the south coast of England. We had a similar sense of humour and that inexplicable bond that all multiple mums tend to develop very quickly, even if you never have the chance to meet in real life. Last year, Karen and her growing family emigrated to Australia. 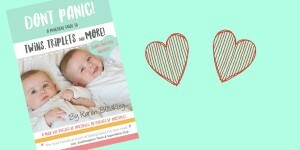 A change in pace has enabled Karen to write something which she had in her packed mind for a long time – a parenting book especially for multiple parents, written by multiple parents. A book which was like the collective wisdom of twin parents in print. Earlier this year, Karen decided it was a good idea to appoint me as her editor. I’ve been a professional writer and social media manager for some time now, and Karen knew the standard of my work from reading my blog posts, albeit on a family travel theme. She knew I understood the unique challenges of parenting more than one baby at a time, and that being from Yorkshire, I would not hesitate to tell her if I thought she was talking rubbish. I’ll be honest. The book is brilliant. It didn’t take much editing. Karen’s writing skills made it a quicker job than she gave herself credit for. The stories of Karen’s experiences and those of other contributing twin and triplet parents made for a fascinating read which sometimes got so close to my own experiences that I had to give up and come back later. It is an emotional rollercoaster in places, but above all, it’s an amazing resource for all expectant twin and triplet parents and shares wisdom that you would not find in a regular parenting book. You can buy it now in ebook format on Amazon.